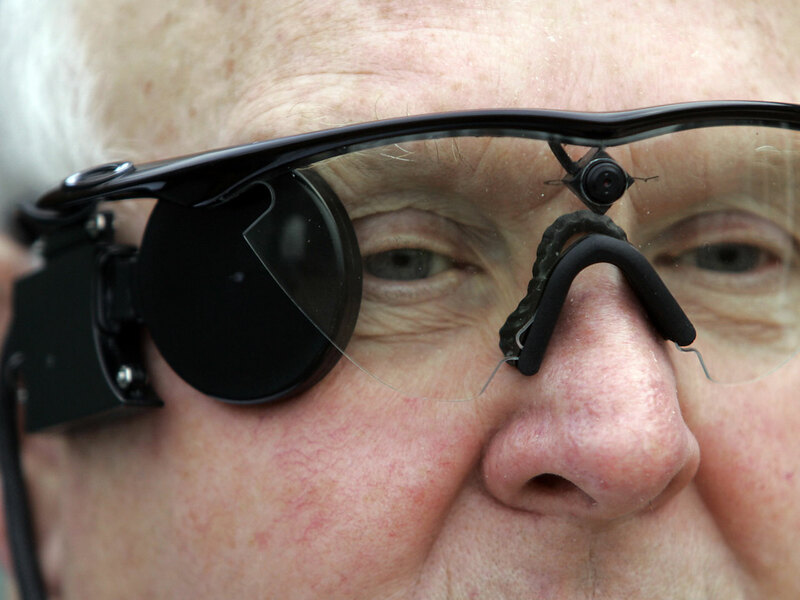 A bionic eye may soon help give some sight back to people who lost their vision due to a degenerative eye disease. The Argus II by Second Sight, which was approved by the Food and Drug Administration in February, is set to hit the U.S. market soon. Specifically, the bionic eye can help people who suffer from retinitis pigmentosa, a rare disease that destroys the photoreceptor cells in the eye's retina. The retina is the tissue layer at the back of the inner eye responsible for converting images to nerve signals which are then sent to the brain. When the cells are damaged, the person cannot perceive light and dark. About 1 in every 4,000 people has the disease, according to government estimates. To restore light and dark vision, a chip containing many electrodes is implanted on the patient's retina. The patient wears a pair of glasses with a video camera attached to it. The camera wirelessly sends the recorded image to the electrodes in the chip, which then turns the information into a signal that the brain can understand. Dr. Jacque Duncan, a professor of ophthalmology at UCSF, explained to CNET's Sumi Das that the device allows the patient to "see" the dark and light items in a 60-pixel image. It won't completely restore their vision, but it will give them a sense of shading which helps them know where they are and spot objects around them that are moving. "I walk down a sidewalk from a bus stop to my office on a daily basis and I can see where the grass comes up to a sidewalk," clinical trial participant Dean Lloyd told CNET. Before the Argus II, there was no FDA-approved device to treat retinitis pigmentosa. Dr. Robert Cykiert, a clinical associate professor of ophthalmology at NYU Langone Medical Center in New York City, previously told CBS This Morning that the device would be "like night and day" for patients with retinitis pigmentosa. "This new technology would help 100,000 people and could really improve their quality of life. They won't be able to read fine print, but they'll be seeing well enough to possibly walk down the street, avoid bumping into lamp posts and cars, and possibly even cross the street," Cykiert said. Second Sight said that about 100 people are expected to get the device sometime this year. It costs about $145,000, but it is covered by Medicare. They're currently working on software upgrades, improving the resolution and potentially being able to restore color vision with their devices.